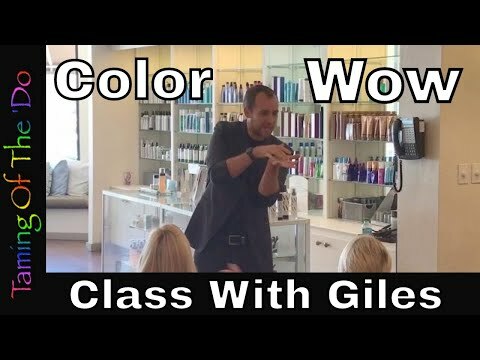 This is part 1 of 5 of our Color Wow class with Giles Robinson at the Casablanca Beauty Center in Jacksonville, FL. Watch the video below or you can read the text following the video. “I’ve worked with color since the very beginning. 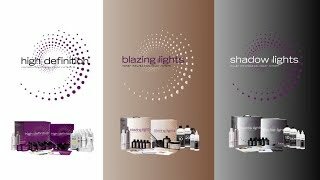 I was working in London at the time when we were the first salon to get the Color Wow line. It was almost five years ago now and since then, it’s gotten to be like, kind of rocket ship. I’ve actually known the owners since I very first started in the salon in London. So there’s a woman behind this…and there’s a guy. He’s like a silent partner and he’s British. The woman, Gail Federici, she is like a genius. She’s amazing! I’d say I’ve known her since I was 16 years old when I started in hairdressing. The beauty of Color Wow I think, is the story behind it. It’s kind of like her mindset. Back in the day, like over 30 years ago, Gail created a haircare line, you know, and the haircare line that she made was really renowned for problem solving. You know, she created some of the categories we have now. It literally shaped the way all hair care lines are kind of structured. She started putting silicone on the hair before back in the day before it was done. The brand that she was responsible for was John Frieda. Okay, just so you’re kind of familiar with what I’m talking about, I used to be John’s assistant for years. I assisted him when I was 16, so that’s why I kind of known him for so long. It was like a mass brand, so I’m not gonna dwell on it. It’s interesting, because when she made those products, like we all know when Frizz Ease Serum came out. It was like revolutionary. And now, actually the thought of putting silicon on the hair, it’s kind of insane! And now you look at any frizz product on the market, most of them utilizing silicones. All of fancy oils that are out there are predominantly silicon-based. and even making products like, for blond hair, the frizzy hair, the thickening hair, to actually categorize hair care. They’ve never really been done before, so it’s kind of quite unique. To make a long story short, that was all like in the past. Now, Gail has this mindset of problem solving, and wanting to do something like new and innovative and different. When she sold that company, she was like done. At that point, she had intentions of ever going back into the hair care business ever again. She was very very successful and well out of that company. In the mean time, she actually had a record label. Gail is very entrepreneurial. She like moved her whole family to Atlanta where everything was happening with the record label. She said what was interesting is, all these women that were working for her were all coloring their hair. There were blondes, and pinks, and blue you know. All these things that you never saw, like 20 years ago, but nowadays it’s just normal for someone to completely color their hair. When she was looking at all these products, and all these ingredients, and all these women who were still struggling from these problems of dulling and breakage. 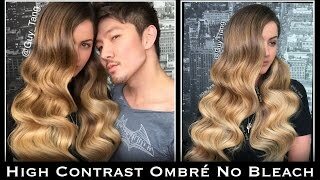 Like this color treated hair that now is being so compromised. When she looked at all the ingredients, and the products that were kind of out there, they just weren’t making the hair look so good. Her whole thing was, I have to just create a line of products that is specifically designed to look after this new hair texture that everyone is really struggling to deal with. That was it. She called her whole original team back. The same chemist that she worked with. Are you familiar with the company called Zotos? So they made like perms, like way back, so that’s where Gail started her hair care line 35 years ago. The same chemist that she worked with there, this guy called Dr. Joe Cincotta, who’s like this genius. He was working under the guy that created the first cold perm. He was like his protege, so he’s a real like genius in hair. So Dr. Joe went on and worked with Gail in the John Frieda days. Then when she had this idea for a product, developed specifically for the trade and for us. To help us do our job better, she pulled in Dr. Joe again. He’s got a laboratory in our head office in Connecticut. So everything here for Color Wow really comes from Gail’s idea of problem solution. Like what are the problems that are still in the market? And then Dr. Joe’s genius of formulating these like, incredible formulas, which tackle literally, like the biggest problems. That is why Color Wow kind of exists, which I think is kind of cool. I think the unique thing is, a lot of brands nowadays get kind of either swallowed up by big business. Or you know there’s, I guess people pumping money into them and they want to see profits, and they’re always hammering these companies. You need to make me another shampoo, or you need to make me another product, and they’re run by marketing and investors, Where I think the beauty of Color Wow, which i think is getting more and more unique nowadays, is the fact that it’s solely owned by Gail. And her passion is haircare. She doesn’t need Color Wow for the money, so there’s no like rush on making products and trying to come up with a product. Yes, when we come out with a genius product, we can mess it up! LOL Let’s just get that cleared out of the way. But still, that is the beauty of it. So Dr. Joe spent three years developing a product. There’s no financial pressure on him. There’s no time pressure on him. It’s like Dr. Joe, this is the problem. Solve it. Do whatever it takes to solve that problem, and then you get a genius product. Then you market it so it’s very different to the way things are, and that is why, in like almost five years, that is the Color Wow line. We don’t just line extend for the sake of it. I mean, we’re in like sixty countries in that short amount of time, but yet we still keep it small and compact. When you have genius products, like some of you have used the products, right? When you have genius products, you can do so much with so little. Personally for me, I mean, yes the Dreamcoat is absolutely incredible. But for me, my favorite thing in the whole line is the Color Security Shampoo by far. What it does to the hair and the kind of the genius thought process behind it, because there’s a lot of shampoos out there. We all know that when you look at any haircare line that comes out, they have like six to nine different shampoos. They are all claiming to do something different. You have like one for thickening, one for smoothing, one for shining, one for the luxury, one for curl, etc. What we actually noticed as a company when we were looking at women’s hair was dulling. And women’s hair that was thinning as they were getting older…the two big problems. When Dr. Joe tore apart all of these ingredients in these shampoos, we noticed that every shampoo that makes a claim, whether it is thickening, or smoothing, or shining, whatever it’s doing, has to actually leave an ingredient on your hair. Its engineered to stick, otherwise it can’t make the claim. So over time, like I was telling about all this marketing. Everyone keeps needing to make different shampoos. But what’s happening, all these ingredients are actually sticking to your head because they’re engineered to stick, otherwise a shampoo company can’t make that claim. So over time, you actually get this buildup, not only on your hair that dulls it, but you can actually get it on your scalp and your follicles. So if you think shampoos have got thickening agents, silicones, conditioners, pearlising agents to make them look pretty, none of those ingredients have anything to do with cleansing whatsoever. You see it kind of makes some sense. So we made you shampoo that quite simply, all it does is cleanse your hair and your scalp and it leaves nothing behind. On the other hand, it’s not a clarifier, so it’s actually clinically proven to be as gentle as water on your cuticle. So for like the richest color or the curliest, frizziest hair, it keeps that cuticle completely controlled but it leaves nothing behind. Ultimately for me, that’s all I ever want from a shampoo. I don’t want to wash somebody’s hair and then start styling it and not quite know what’s in it. And especially, I mean I do classes all over the place and I wash people’s hair all the time. Hairdressers hair. I cannot tell you the amount of hairdresser’s hair that I shampoo and it has like this buildup. And we know it from our clients, they get this built up, and I’m like, “what is that in your hair?” You’re a hairdresser and they’re like, “oh you know, I just kind of get used to it.” What they do seriously…because what they’re doing, they can’t get it out and then they’re washing their hair with some like luxurious, thick creamy looking shampoo, which literally is sticking a lot more stuff onto it. So they are fighting a losing battle. Do you see where I’m going with this? An then what bewilders me when you see some haircare line, they have like six shampoos, and then a weekly clarifier! So it’s like right in front of your face. You’re like yeah, use these, and then the end of the week, strip off all the crap that we stuck on. It’s like amazing! And Gail’s mindset as well. She’s very very passionate about this, especially the shampoo. It’s like, if you want to thicken, or smooth, or shine, or curl your hair, she’s like that’s why you have a styling product. The thought of trying to do it when you shampoo is like weird. Because you just want to get the hair clean, and then put a styling product on, and then finish the hair. Then when you wash it again, it’s clean again. You see it just gets nice and easy and simple. I just make it sound complicated. But for me, without a shadow of a doubt, I’m completely obsessed with this. Rich knows that I can’t ever stop going on about it. Just one shampoo for everybody. Try it. It’s very honestly, it’s weird, because we’re so accustomed to doing it one way. But like Gail was saying, back in the day, she said there was just cleaning shampoos. It was like simple. Especially for the professional market, you just had a cleansing shampoo, and now like I said marketing has taken over. This is like awesome, because you wash the hair…and I’m telling you especially with something like Dreamcoat, give the hair three shampoos. It is so clean, not stripped, because it’s as gentle as water. Remember that. Put some that Dreamcoat on, blow-dry. I’m telling you that hair it’s flippin amazing! Because the reflection on it, and the shine of just healthy hair, it’s like crazy! I was telling Rich earlier, just quickly. It’s a little segue. I was in Virginia recently and I did two classes, right. And this one day, back to back, and I styled two hairdressers hair. And for some reason…I just remember this, they were both 39 years old. I don’t know why but, they’re both 39 years old and I wash both the hair exactly the same, three shampoos with the Wow. Just remove the build-up. Dreamcoat, blow dry. Both of them said to me, “I have never felt or seen my hair look this good…ever!” Probably until they were like 10 and that helps virgin, but this this was like serious! 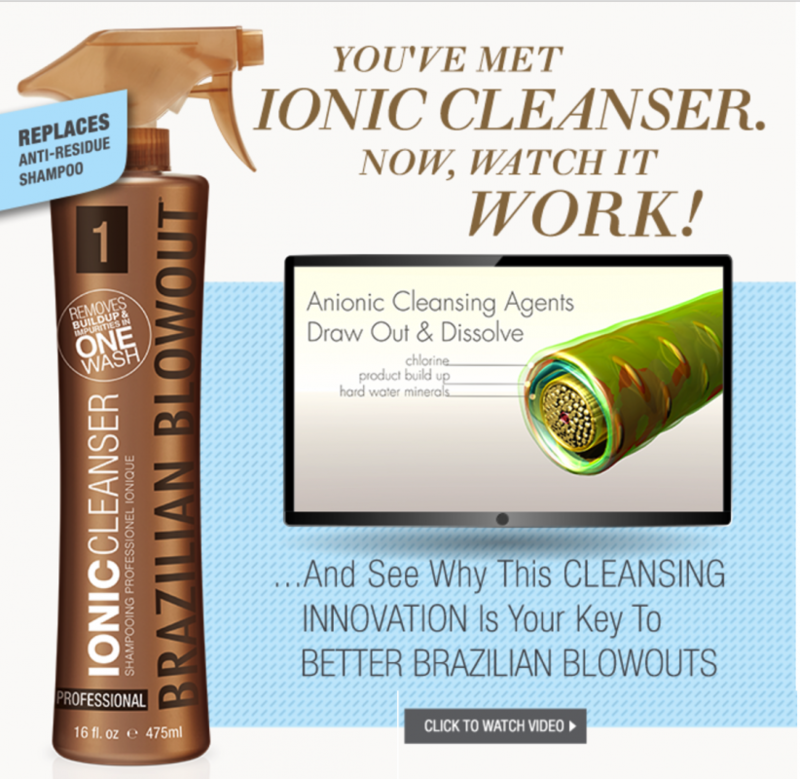 Because it’s not a clarifier, you’re not going to give it two shampoos. It’s not going to rip everything out of that hair, including oils, cuticle, and everything. Its very gentle. So when I first use it, not in every case but in some cases, I will give them three washes, especially if I’m trying to make a point. That hair could look really really good and like Richard said, I give the head like three shampoos. The other day I had to do like four shampoos, it was so bad. It’s a hairdresser (laughing) just to remove all the residual build-up. I know you’re cranking through clients, but once the hair is clean and you’re in the routine, it’s very easy. And honestly, your clients will be like addicted to it. I’ve had stories of salons, like one girl in particular, she was like Giles, I had one of my clients talk me into driving to the salon on a Sunday, put the shampoo in the letterbox outside because she was traveling and didn’t want to like go without it! I know the same happens with the Dreamcoat too. It is really important because it’s the foundation of everything. You can use it on keratin extensions, finest hair, thickest, its safe. It actually warranties Hotheads Extensions, just for an example. So it’s really good for that. Completely crystal clear in formulation, has a rich lather to it when you wash the hair. It actually lathers more the cleaner the hair gets, so you actually know when the hair is clean. And it’s still sulfate free. Thanks Rich. Team, we’re a team. Yes it does come in litres. If you are a stylist and want to find out more, please visit The Salon Center or Color Wow. Thanks for reading!